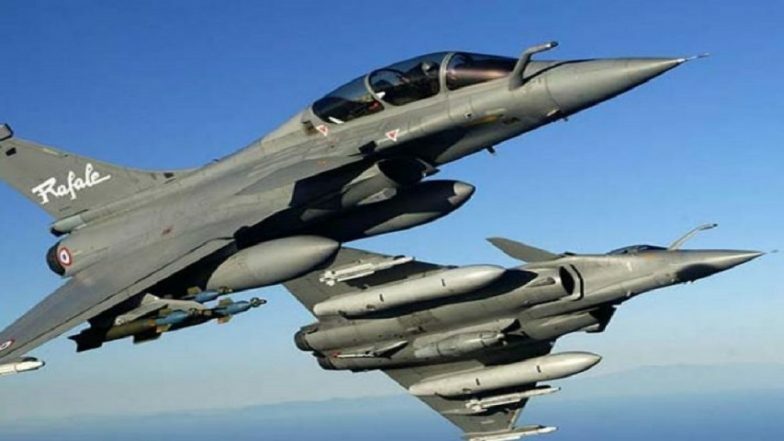 New Delhi, April 11: In a major embarrassment for Pakistan, Alexandre Ziegler, French Ambassador to India, termed media reports claiming that Pakistani Air Force pilots were trained on Rafale jets as “fake”. He tweeted, “I can confirm that it is fake news”. The clarification has come after ainonline.com reported that the first batch of pilots trained to fly Rafale jets for Qatar in November 2017 were Pakistani exchange officers. Pakistan Air Force F-16 Jet Shot Down By India After Trying To Violate Indian Airspace in Rajouri of Jammu And Kashmir. The first delivery of Rafale jets was made to Qatar on February 6, 2019. The ceremony was attended by Qatar’s Deputy Prime Minister and Minister of State for Defence Affairs, HE Dr Khalid bin Mohamed al-Attiyah, Qatar's Ambassador to France, Sheikh Ali bin Jassim al-Thani, and Staff Major General (Pilot) Mubarak bin Mohamed Al Khayareen. F-16 Was Used By Pakistan, IAF Displays AMRAAM Missile Part As Proof; All About The Evidence Presented by India (See Photos And Video). During the ceremony, the new Qatari Rafale squadron was named "Al Adyiyat". Qatar signed a Euro 6.3 billion agreement for the purchase of 24 Rafales in May 2015. Meanwhile, Escadron de Chasse 04.030 was established at Mont-de-Marsan as the Qatar Rafale Squadron on Oct. 1, 2017. The Amir of Qatar, Sheikh Tamim bin Hamad al Thani, visited the Qatari Rafale Squadron at Mont-de-Marsan on July 6, 2018. He was accompanied by French defense minister Florence Parly. Pakistan military personnel have been deployed to operate with the armed forces of several Middle Eastern countries for many years. In January 2018, Major General (Pilot) Mubarak Mohammed Al-Kumait Al-Khayarin, Commander of Qatar Emiri Air Force also visited Air Headquarters Islamabad.